Michael Perlin, the director, writer and producer of the documentary film, 3 Magic Words, is announcing the release his new book, 3 Magic Words. There is a collective belief that we are all separate and this separation consciousness has caused man to identify with his religion causing a worldwide distortion of spirituality. Michael Perlin, the director, writer and producer of the documentary film, 3 Magic Words, is announcing the release of his new book, 3 Magic Words. 3 Magic Words the movie, distributed by Warner Brothers Digital Distribution, has been viewed by over one million people since its release in the Spring of 2012. The movie has been toured and screened for the public around the world and has been reported about in a wide range of traditional and online media outlets since its launch. 3 Magic Words The Movie is a documentary that has been called, “The most transformational film for the new age.” and won the #12 spot on AwareGuide’s top transformational films of 2012. The film had its big Hollywood Premiere at the Harmony Gold Theater and sold out all 400 seats the day before the event. It had its world premiere in London on Dec 21, 2012 at the Odeon West End Theater in Leicester Square. Today, 3 Magic Words continues to gain viewers online via Amazon, Hulu, Itunes and via many different cable networks. The film is also available in DVD format, and is subtitled in English, Arabic, Thai, Croatian, Chinese, French, German, Hungarian, Japanese, Norwegian, Portuguese, Romanian, Russian, Spanish, Filipino, Tamil and Italian. The 3 Magic Words DVD is currently being considered for coverage in 2014 by a number of top media outlets including the Associated Press, Newsweek Magazine, NPR, and The OWN Network’s “Super Soul Sunday” program among others. Michael Perlin's forthcoming 3 Magic Words Book, is a metaphysical book that explores the secret teachings of all the great philosophers and spiritual geniuses of our time and reveals a common theme throughout all of them. The book explores the fundamental spiritual reason we still have the problems in the world today including, terrorism, violence, pollution, Nuclear radiation, religious wars, human injustice, etc. It explains that there is a collective belief that we are all separate and this separation consciousness has caused man to identify with his religion causing a worldwide distortion of spirituality. Perlin believes that a real shift will begin to take place when we finally go from being a religious planet to a spiritual one. The classic book, Three Magic Words; Your Key to Power, Peace and Plenty by U.S. Andersen became a widely successful self-help book and is still popular today. It is also among Wayne Dyer’s favorite books. This book was the movie’s inspiration and in 1977 it was the first self-help book to reveal the three words to the masses. U.S. Andersen’s classic was a series of essays aimed at revealing to the reader his power over all things and introduced the “power of positive thinking” long before The Secret was released. 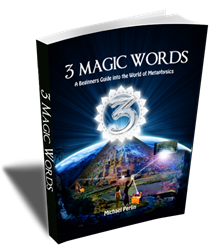 3 Magic Words The Book is a beginner’s guide into the world of metaphysics and spirituality. The book is like no other book on the subject as it geared for a researcher of truth. The book explores creation myths, advanced civilizations, ancient mysteries, and explores the secret teachings of many divinely inspired masters and their message to mankind. 3 Magic Words The Book will be released on Amazon in August 2014.